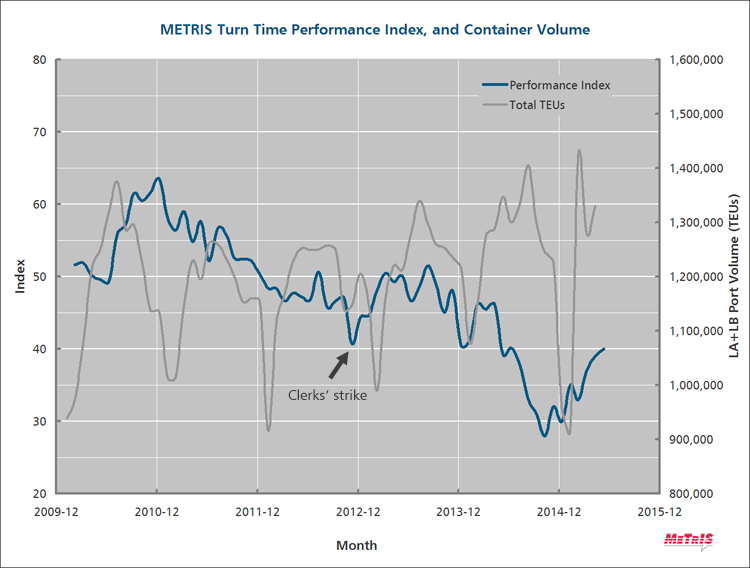 Port Truck Turn Time: in the Doldrums? Turn Time — in the Doldrums? The fundamentals at LA/LB are strong. It's too early to be negative on the prospect of improvement. Turn time at LA/LB is on the mend. It has certainly bounced back from November 2014 when it bottomed out at 28 on the METRIS 0-100 Index. In June 2015 it stood at an 11-month high of 40. Do the gains mean that the chassis problem has been solved? That vessel size was never a factor? That labor relations are back to normal? That new delivery methods are having an impact? It's impossible to draw any of these conclusions looking at turn time alone. A better justified conclusion is that at least some of 2014's problems are lingering. A METRIS Index of 40 is a D– at best; some would argue an F. It's on par with December 2012 (the backlog and chaotic aftermath of the clerks' strike) and June 2014 (the worst month on record at the time). Prevalence of 6-hour visits remains troublesome, around 1%. There's a long way to go. A glance at the tail end of the graph (Figure 1) seems to indicate that the recovery is running out of steam, and leveling off. There's talk about this being the “new normal,” the doldrums. Is this valid? Figure 1. Turn time performance is still poor, but improving slowly. In June 2015 it picked up only to the level of the 2012 clerks' strike. This is no longer a systemic malaise. The residual problems are largely confined to three terminals. At the other terminals, performance isn't back to what it was a couple of years ago, but it's trending positively. Volume is near record levels, and has been oscillating wildly from near-record high to near-record low and back again. On the surface, uncertainty is not conducive to gains in performance. But the volume drops in January and February were a boon that helped the system clear the backlog. A sustained upward macro-trend in productivity, at a time of record traffic, even if slow, is good news. There are worse problems to have than record volume. The geographic fundamentals of LA/LB — location, infrastructure, skilled labor supply, rail connectivity — are overwhelmingly strong. What got tested in 2014 was its operating capacity, that was temporarily diminished by unusual events. It's not the same as a loss of physical capacity, which would be a longer-term problem, and a reason to look elsewhere. The challenge for industry leaders is to keep the recent operational difficulties from looking like they'll become permanent.